MQX stands for Machine Quilter’s Expo. It is a large quilt show that takes place in early April in Manchester NH. I have attended several times now because it is literally less than an hour drive away from my home. I have always been in awe of the amazing quilts shown there. So last year I took a “winner’s tour”. A guide walked us through the quilts with ribbons on them and told us why they won and explained the point criteria. Unlike other shows where most of the points are awarded on piecing and color, at this show the majority of points are awarded on the machine quilting and less on the piecing, color choice and binding. Since I machine quilt for hire, I thought this year I would see if I could even qualify to get into this juried show. So I entered two of my quilts hoping at least one would get in. Well both of them qualified. These quilts were not made intentionally for a show. One was made for my bed at home, while the other was made as a sample for a class I was teaching. Needless to say, I was honored to be accepted into this elite group at MQX. 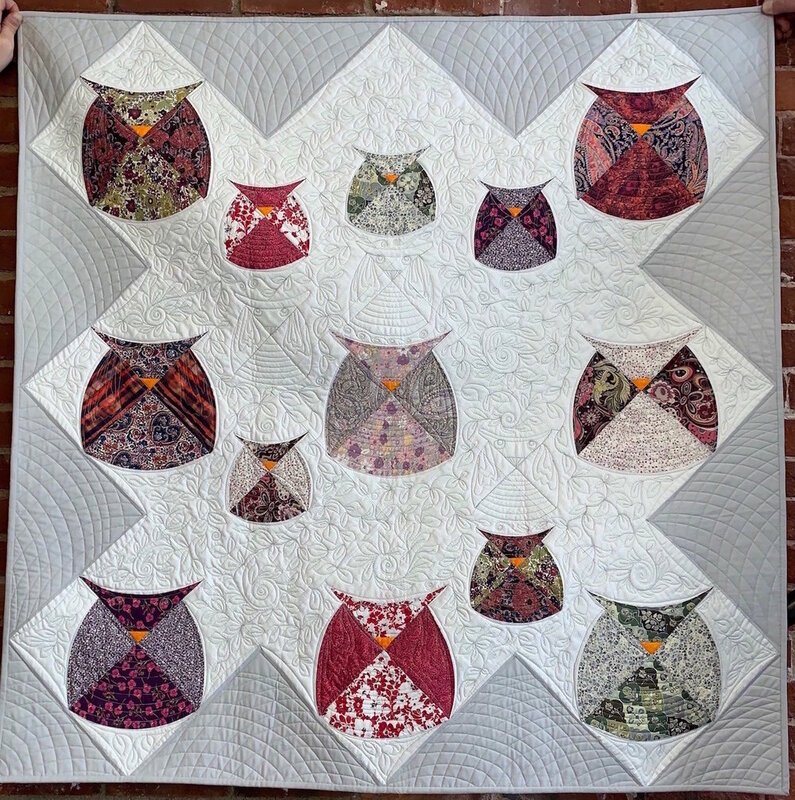 Liberty Owls was made for a class sample. The class was on curved piecing. I used the Sew Kind of Wonderful rulers and a selection of my cherished Liberty of London prints. It was made quickly and quilted in a very unplanned, ad lib style. It was entered in the “Large Wallhanging” category. Twisted Tornado also uses the Sew Kind of Wonderful curved rulers. I am a bit obsessed with their patterns. This quilt took me a couple of years to make, is large, and was entered in the “Bed Quilt” category. I prepared the quilts, made new labels, and shipped them off to NH. When the big day came, I went to the awards ceremony and preview show. It was a great way to see and compare the competition without the crowds of people around. Well, again, I was blown away by the competition. It made my quilts look like the elementary version in comparison to the winners. But I had to remind myself that this was a juried show and I had to pass certain criteria before being allowed in. 3 you really should not even think to enter into this show. I scored all 7’s and 8’s. I guess I could use improvement. Again I had to remind myself that I did not make either of these quilts with the intention of a top notch show. But I did spend time custom quilting them. The larger quilt that I spent way more time on got a slightly lower score than the owl quilt that I threw together quickly. All in all, this was quite the learning experience. I decided I needed a last minute gift for a special someone. But why make one when you can make two! So I pieced these runners up. I used one charm pack of black and golds and my mini quick curve ruler by Sew Kind of Wonderful. Differences so far are the reds. I wanted one to be a bit more toned down so used a dark blackish red. The other used a brighter red with gold swirls. Believe it or not, the backgrounds are the same until the outside border. With the brighter red one on the left, I continued the bright red into the inner border, then finished it off with the same neutral gold swirl fabric from inside. The one on the right focused on the gold, using a darker gold inner border and finishing off with a tonal gold border. The final border is has a tone between the darker inner border and the neutral background fabric. Now onto the quilting. The advantage of making two at the same time is the fact that I only have to load once. I loaded one backing fabric, a white with gold dot, and was able to lay the table runners side by side. Making the quilting quick and easy. I free motion quilted both runners in gold Cleopatra Glide thread. It is a nice shiny gold really adding to the elegance of these runners. This is the fun part for me. I can just doodle draw to get this quilting. This is the artistry I love to do. Here are final photos. One will be a gift. The other will be sold to a lucky someone. Either way, both are elegant gifts. Even the backs are elegant. They can almost be reversible. Both runners the same but different inside squares, borders and quilting. I think this is a great way to make something and have an extra on hand. You never know when you need a gift. I had the pleasure of attending the Vermont Quilt Festival held on June 22-24 this year. It was an honor to see two customer quilts hung with pride. Next is an amazing appliqué quilt by Anne Messier. I love the gold tones and the scrappy appliqués is so perfect. Anne even appliquéd that brick red V-type outside border on instead of piecing it. This quilt was custom quilted in simple leafy vines in a gold Omni thread to blend. It is not overdone so Anne's appliqué shines. Anne certainly deserves that red ribbon attached to the quilt. It all started exactly a year ago. I was coming home from a long arm quilt conference and got stuck in a snowstorm. During that time I get an email from a board member of the Wayside Quilt Guild, of which I am a member. She asks me if I would coordinate the raffle quilt for the guild’s next quilt show, a year and a half away. In previous years, this quilt has earned the guild a large sum of money so this is important. So I sit in my hotel room with a sketchbook, fresh from 4 days of long arm training and inspiration, and come up with a sketch. Sample blocks were made up once I got home. I realized everyone in the guild is not at the same skill level and I wanted everyone to participate. I made up three paper pieced patterns all at 6 ½” square. The easiest pattern was the piano key border, made up of 3 x (2 ½” x 6 ½”) pieces. The next level of difficulty was the flying geese. Everyone loves flying geese. It’s a quilt staple. A square of geese consisted of 3 geese at 2 ½” x 6 ½”. Lastly the most difficult was the star unit I took from a Carol Doak book. A 6 ½” quarter star was paper pieced in 2 pieces then sewn together. Only the more advanced ladies in our guild took this pattern. After drafting all three patterns, I figured out what size pieces needed to be cut for each and wrote basic instructions on each pattern. I photocopied each pattern and Susan offered to cut up the Kona. Each of the Kona pieces would make 2 blocks. The ladies of the guild were to donate bright batiks from their stash for the insides of the star, geese and piano keys. Its almost summer break. I’ve been handing out patterns and silver Kona for 2 months now. I keep reminding the ladies of the guild that I need their squares by the September meeting. I had no clue as to what I would get in return. The September meeting arrives and I get all sorts of blocks tossed at me. I received 60 quarter star blocks, 55 flying geese blocks and 100 piano key blocks. I only needed 52 piano key blocks to make the outer border so ended up putting the remainder on the back side. My committee got together one morning. I put up a design wall and we played with stars, geese paths. When we had the quilt designed where we all seemed to agree, we switched a few blocks around for better color distribution. I went shopping with another committee member to find that skinny ½” inner border. Many batiks later and climbing up and down a ladder for a better visual, we decided the black with small orange spots popped the most. I found an orange batik backing that coordinated. We met up again to stitch the inner border and all those piano keys. By January the quilt was on my long arm. Again, I doodled on photocopies of the quilt for best design choices. I selected an orange variegated thread. I wanted the stars to swirl so free handed a helix design I learned from Sue at Kismet Quilting. On the few negative gray spaces, I quilted the quarter star in. I wanted the flying geese to pop out so quilted dense lines outside of them. I spent the better part of the week, or a good 24 hours, quilting this quilt. Lastly I bound the quilt in the black to repeat that inner border. Here you can see the star design I shadowed into the outside piano key border. This is the back side, using every one of those leftover piano keys. The quilt show will be at the end of September but in the meantime, we need to promote the quilt. I will get members of the guild to display the quilt at shops around town to sell raffle tickets to the public. One lucky person will win this quilt on September 30. Overall this was a fun experience. I had a vision. I shared it with the guild. The ladies of the guild sewed all those blocks and my committee helped with the layout and sewing together. I was afraid a committee would not agree but this was not the case at all. A few minor disagreements of opinion but nothing we couldn’t work out. It was fun, I made new friends in the process, and have an awesome quilt we are all proud to raffle off for the benefit of the guild.